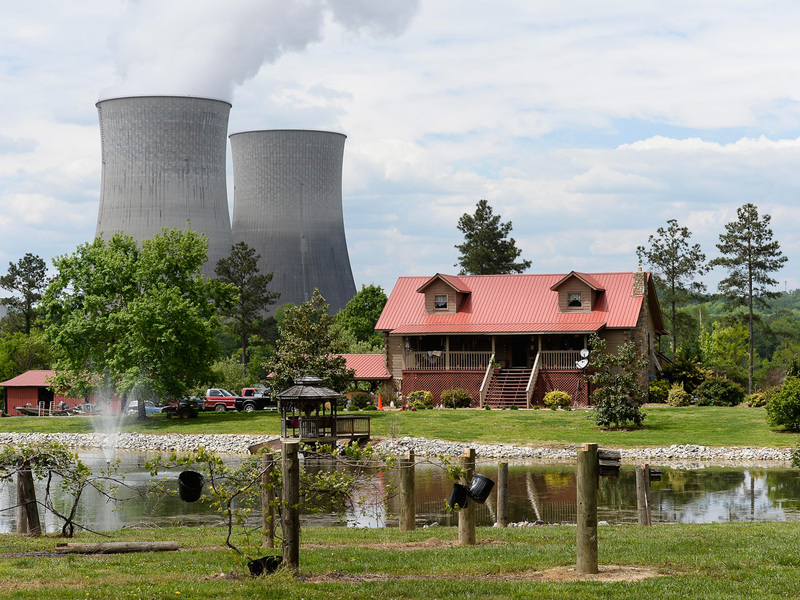 SPRING CITY, Tenn. - Tom Wallace started working at the Watts Bar nuclear plant as a young man in 1979, hoping he could eventually become a reactor operator. It remains a work-in-progress for the Tennessee Valley Authority. Wallace, 55, is still finishing that plant 36 years later, one of the longest building projects in U.S. history. In a bizarre turn, what could soon become the newest U.S. nuclear plant is a piece of 1970s-era technology. In the time it took to build it, Wallace raised two daughters and now has grandchildren. Meanwhile, the nuclear industry has designed a generation of entirely new plants now being built in Georgia and South Carolina. "I would never leave this plant until it's running," Wallace said, standing outside the plant's turbine building in Spring City, about 60 southwest of Knoxville. "This is an important part of my career and life." If nothing else, the second reactor at the Tennessee River site is a cautionary tale for the power industry. When it's finished, it will provide enough electricity to power about 650,000 homes in the Tennessee Valley. The cost of running a nuclear plant is relatively steady, and it does not produce greenhouse gases and other air pollutants. But they are enormously expensive and complicated to build. The project ran decades late. In the early years, workers struggled to meet safety rules and ran up billion-dollar cost overruns. TVA vastly overestimated the demand for electricity decades ago. In 1966, it announced plans to build 17 nuclear reactors in Tennessee, Alabama and Mississippi. By 1985, TVA canceled plans for almost half those reactors because of a slumping economy and spiraling construction costs. The construction of Watts Bar 1 proved a big mess. Regulators approved construction in 1973. A dozen years later, TVA officials requested permission to load the plant's radioactive fuel. However, whistleblowers raised concerns about construction, prompting lengthy delays and inspections. In a 1995 summary, NRC inspectors reported they found poorly welded metal, electrical cables that were damaged during installation, and quality assurance records with missing or incorrect information. It took until 1996 to get the first reactor running. TVA deferred work on its second reactor, which sat unused and was cannibalized for parts. A contractor, Bechtel Power Corp., estimated in 2007 that finishing it would cost $2.5 billion over five years. The estimate badly missed the mark. The latest projections show the costs will be around $4.3 billion - more expensive than a natural gas plant, but cheaper than building a nuclear plant from scratch. The utility says its electrical demand is relatively flat. Starting the nuclear plant will allow it to shutter dirtier coal-fired plants. It's also a long-term hedge in case natural gas prices rise in the future, TVA President Bill Johnson said. "This is going to be a very effective, economic proposition," he said. Federal safety regulators will decide in the coming weeks whether to grant the plant an operating license. Johnson said the facility expects to load its nuclear fuel toward the end of the summer and gradually start operations. Construction got off to a rough start, with an audit by TVA's Office of the Inspector General accusing program managers of being ineffective, failing to provide enough oversight and not disclosing budget problems. The U.S. Nuclear Regulatory Commission fined the utility $70,000 in 2013 for failing to verify all parts purchased for the plant met quality rules. TVA officials said they tracked down every single part, and none of them proved defective. After a management shakeup, construction appears to have improved. The Union of Concerned Scientists wants the commission to make the utility monitor the plant for aging since the facility is not brand new. "It's going to be the brand-new eight-track tape player in the fleet," said David Lochbaum, director of USC' nuclear safety project. He also sits on a TVA community action board, an unpaid position. "I think they can do that homework and show the plant is OK."
Reviving the old technology posed unique issues. TVA pulled out many old pieces of equipment for replacement or refurbishment. The U-shaped control room for the newest reactor was designed to look just like the first, even though some of the underlying technology has changed. No matter where they work, operators controlling the power plants will see identical displays. The Watts Bar plant is the first to pass an NRC inspection showing it has all the emergency backup gear required after a 2011 earthquake and tsunami caused major meltdowns at a nuclear plant in Japan. About 2,500 workers are now employed at the site, including those testing individual plant components. At the end of the day, nobody's going to remember when the plant was finished, said Mike Skaggs, the senior TVA vice president overseeing construction. "What they're going to remember is, is the plant safe? Was it a good decision? Is it reliable?"